The Survivors, their members known only by the order in which they joined, live alone in a rural Colorado mansion. They believe that sickness bears honesty, and that honesty bears change. Fueled by the ritualized Cytoxan treatments that leave them on the verge of death, they instigate the Day of Gifts, a day that spells shocking violence and the group's demise. Enter Mason Hues, formerly known as Thirty-Seven, the group's final member and the only one both alive and free. Eighteen years old and living in a spartan apartment after his release from a year of intensive mental health counseling, he takes a job at a thrift shop and expects to while away his days as quietly and unobtrusively as possible. But when his enigmatic boss Talley learns his secret, she comes to believe that there is still hope in the Survivor philosophy. She pushes Mason to start the group over again--this time with himself as One. 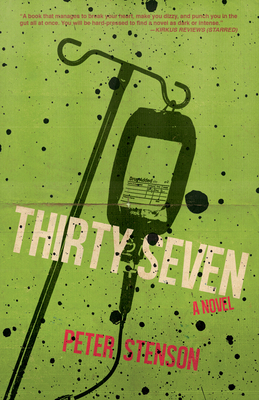 Part Fight Club, part The Girls, and entirely unlike anything you've ever experienced, Peter Stenson's Thirty-Seven is an audacious and austere novel that explores our need to belong. Our need to be loved. Our need to believe in something greater than ourselves, and ultimately our capacity for self-delusion.